LeBron James Opts Out of His Contract With Miami Heat: Where Will He Go? His Wife Savannah Posted A Map of Akron Ohio On Instagram Few Days Ago! LeBron James has opted out of his contract with the Miami Heat. In effect, he will become a free agent starting July 1, 2014. On that date, he can entertain the respective offers of other NBA Teams. Where will he go? Well, only a few people noticed this few weeks ago. 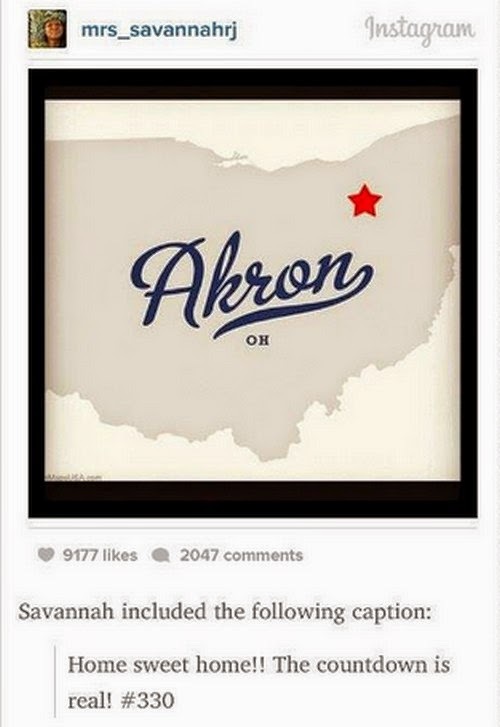 LeBron's wife Savannah posted a map of Akron Ohio on her Instagram account with the caption "Home sweet home! The countdown is real! #330." I don't know if that Instagram post is directly related to LBJ's next destination, but I can't stop my self from formulating some speculations especially when I look back at what unfolded in the previous days. We may recall that Carmelo Anthony also opted out of his contract with the Knicks. And part of his many conditions is that he will consider signing with the Cleveland Cavaliers if they will be able to bring back LeBron James. LeBron and Melo are close friends. I will not be surprised if they will join forces in the coming months. Imagine Kyrie Irving, LeBron James, and Carmelo Anthony in one team. Wow, just wow!